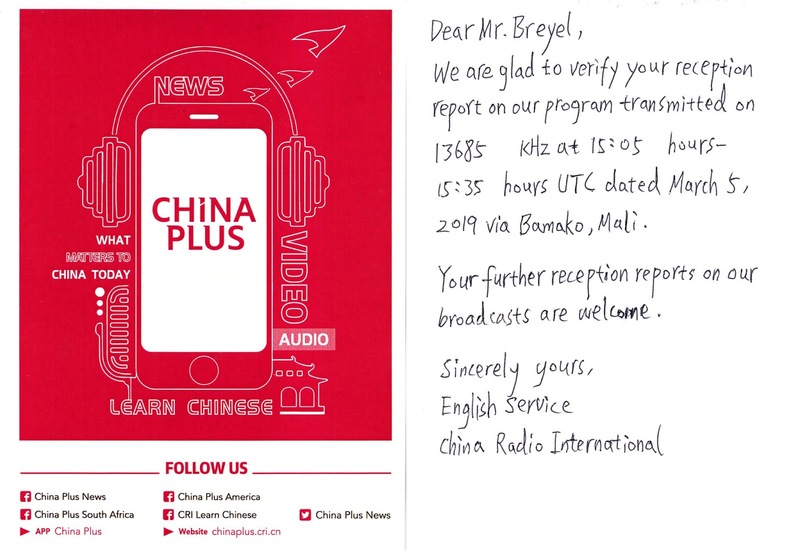 China Radio International, transmitting from Bomako (Mali), was logged on 5 March 2019. English programming with commentary on US-China relationship and comparisons to it in the 1960s. This was observed at 15.05 till 15.29 UTC, then station ID leading into another programme. 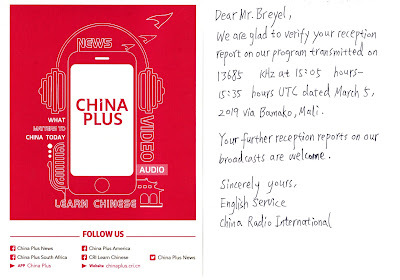 Reception on 13.685 kHz rated a SINPO of 34433 -- fair signal, clear and audible content, despite slight fade. By 15.30 UTC, signal worsened often fading under atmospheric noise. HERE and HERE is CRI (via Bomako). Reception report was emailed the following day. QSL card arrived in the mail on 15 April 2019.